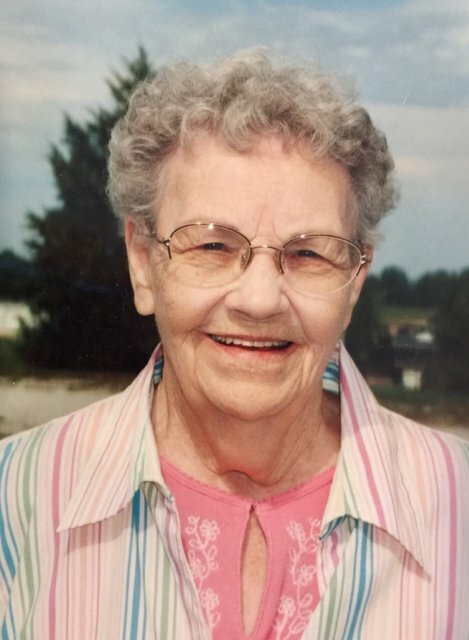 Funeral services for Jewell Marie Hall, 97, Springfield, Missouri, will be held at 2:00 p.m., Saturday, February 2, 2019 in the Rose Chapel at Robertson-Drago Funeral Home. Mrs. Hall passed away at 6:50 a.m., Wednesday, January 30, 2019 in Springfield, Missouri. She was born October 16, 1921, in Ozark County, Missouri, to John M. Young and Fannie Hall Young. On August 9, 1947, she was married at Elko, Nevada, to Ray Lee Hall, who preceded her in death on December 8, 1971. Before her retirement, Mrs. Hall worked at Edco Microfilming. She was a loving mother and grandmother. Mrs. Hall was a member of Webster Park Baptist Church, Springfield, Missouri. She is survived by four children, Wanda June Rathbun and husband, Fred, Springfield, Missouri, Billy Hall and wife, Ginger, Commerce, Texas, Donna Barnhouse and husband, John, Strafford, Missouri and Patsy Holley and husband, Randy, Springfield, Missouri; nine grandchildren, Leslie Manary and husband, Chris, Teresa Carpenter and husband, Steve, Kelly Hall and wife, Judy, Kim Pirkle and husband, Scott, Carrie Wright and husband, Eric, Jennifer Hilzendeger and husband, Joey, Kristi Lane and husband, Wayne, Nick Vickery and wife, Mary and Adam Vickery and wife, Amy; many great-grandchildren and great-great-grandchildren; and several nieces and nephews. Her parents, husband and all of her siblings, preceded her in death. Visitation will be held from 1:00 until 2:00 p.m., Saturday, at Robertson-Drago Funeral Home. Burial will be in the Howell Memorial Park Cemetery. Memorial contributions may be made to Alzheimer’s Association and may be left at Robertson-Drago Funeral Home. Our sincere sympathy. We are keeping the family in our thoughts and prayers.